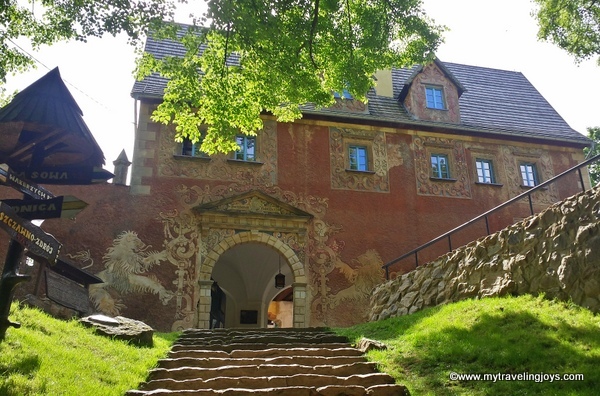 Nestled in the Owl Mountains, Zamek Grodno sits perched upon the peak of Mt. Choina guarding the nearby village and lush green countryside. Originally built in the 13th century by Prince Bolko I, this faded defensive castle is considered one of the most impressive medieval castles in Poland even though it was once nicknamed “the abode of robbers.” The castle is located about 1 hour south of Wrocław, which is where I started my solo road trip in the Dolny Sląsk (Lower Silesia) region. Arriving right at 9 a.m., I found the ticket booth empty so I started wandering up the cobblestoned walkway. I soon ran into an employee and had to explain in my elementary Polish that no one was there, but I wanted to buy a ticket. Fortunately, I easily procured my ticket and then set off to explore this medieval castle. The first room once housed a torture chamber with nasty, spiky-looking torture devices. The second room contained several armor suits and medieval weapons. Unfortunately, like most Polish castles I’ve seen, very few, if any, signs are written in English. Honestly, I wish Poland would learn how to market itself better and promote itself more often to English-speaking tourists. Sure, the major tourist draws are always Krakow, Warsaw, Gdańsk and the Zakopane mountains. But I think there’s so much more to see in Poland - like all these amazing castles! Climbing up a spiral of steps, I reached the castle’s tower where you can enjoy a fantastic view of the mountains. The castle is surrounded by a forest of trees and part of the dammed Lubachowskie Lake, located at the foothills. 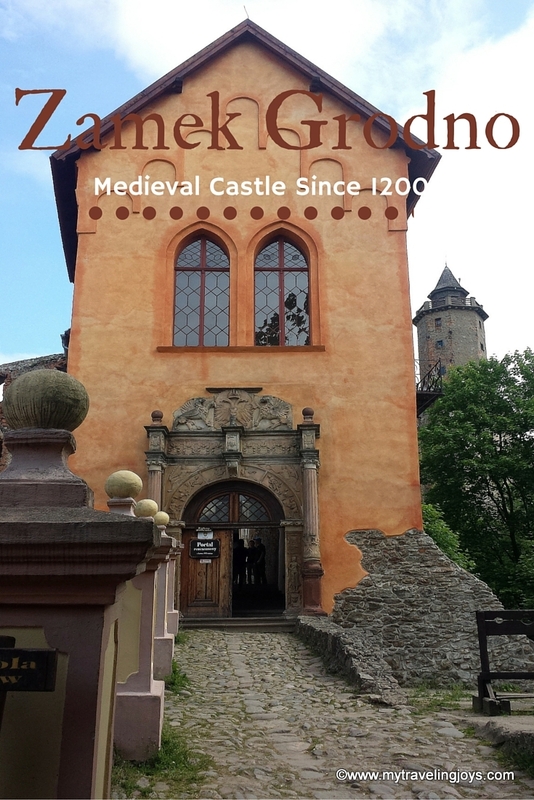 Like most castles, Zamek Grodno has a lengthy and complicated history. According to local legend, an English knight founded a watchtower here around the year 800, but the first real evidence of a castle dates to 1290. Over the centuries, several different noblemen ruled the castle. 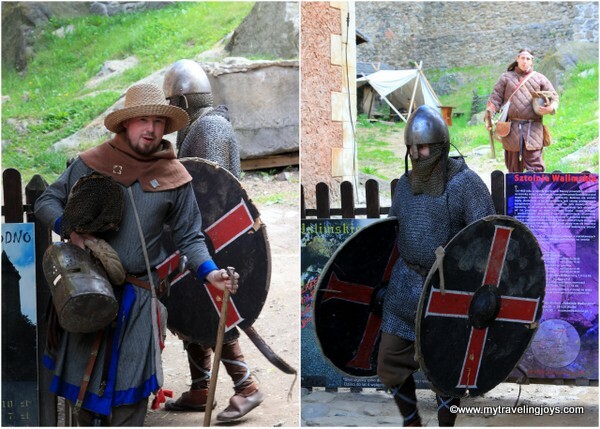 During the 15th century, the castle was home to a group of knights-robbers, who, together with their teams, did robberies and looting in the area. In the 16th century, the castle was reconstructed in the new Renaissance style and an ornate gatehouse was added with beautiful sgraffito – a technique of wall décor produced by applying layers of plaster in tinted colors to a moistened surface popularized in Italy. This gatehouse is the first thing I saw as I climbed up the hill from the parking lot. Gorgeous! A sign above the gatehouse stated the year 1570. Up-close with the beautiful sgraffito technique on the gatehouse. During the 18th century, the castle was badly destroyed in the battles against the Swedes during the Thirty Years’ War, and the tower collapsed. Finally, in 1824, a history professor from Wrocław stepped in, proclaiming the castle’s importance. The local court ruled in his favor and issued a legal protection, declaring the castle be used for tourism purposes. On the day I visited, several groups of school-age children toured the castle. How cool would that be as a kid? One of the Polish teachers spoke to me in English for a bit because he was curious why an American was touring out here by herself. In addition, a number of teenagers were dressed in Renaissance-period costumes for some kind of re-enactment thing. If you ever find yourself in the Lower Silesia region, don’t miss out on exploring Zamek Grodno, my favorite medieval castle in Poland! During May to September, the castle is open 9 a.m.-6 p.m. Monday to Friday, and and 9 a.m.-7 p.m. Saturdays, Sundays and holidays. During October to April, the castle is open 9 a.m.-5 p.m. Monday to Friday, and 9 a.m.-6 p.m. on Saturdays, Sundays and holidays. The castle is closed on Easter Sunday, November 1 and December 24-25. Cost: 12zł for adult tickets. Once it was also my dream to visit the zamek-grodno but I couldn't fulfil this dream just due to some problems with the work. Maybe some day I will be able to visit the dream palace.